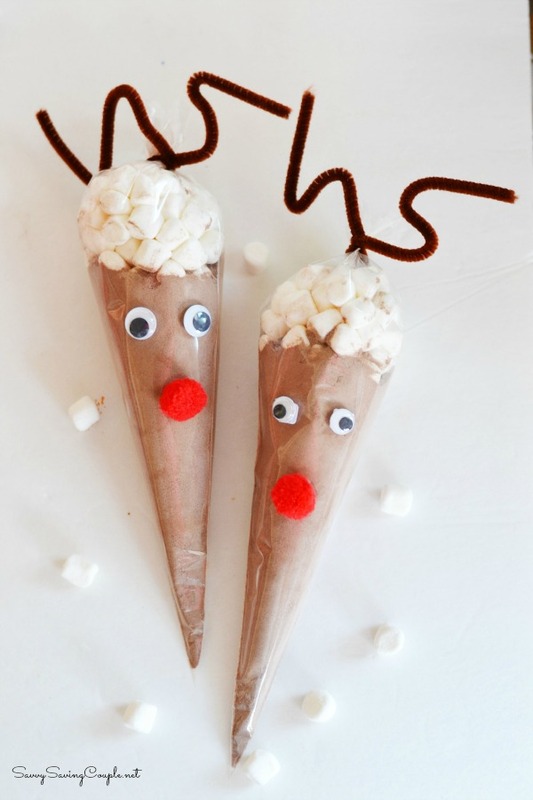 Reindeer Hot Cocoa Cones – Talk about a super cute stocking stuffer idea! Who doesn’t love to curl up on the couch at Christmas time and sip on some delicious hot cocoa?! 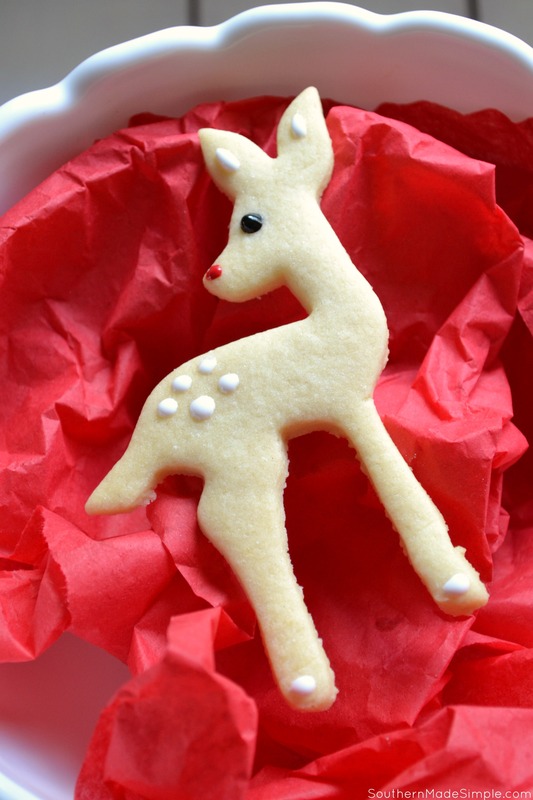 These little reindeer treats can be found over at Savvy Saving Couple! 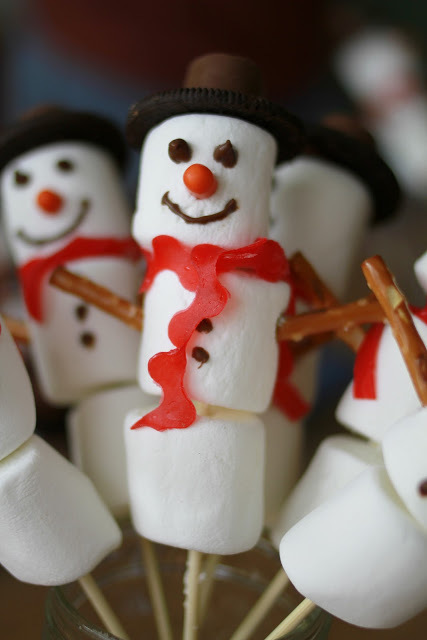 Snowman Treats on a Stick – Aren’t these little snowmen on a stick treats just too cute? Almost too cute to eat, even! You can find a full tutorial and a list of all the supplies you’ll need to assemble your snowmen over at Flexible Dreams! 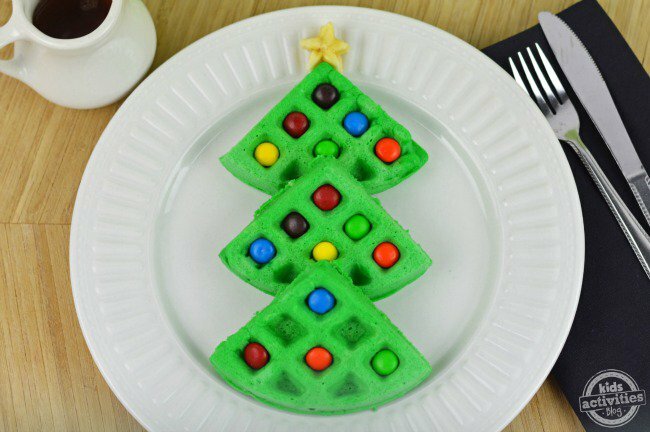 Christmas Tree Waffles – What better way to celebrate Christmas morning than with a yummy plate full of Christmas waffles! Pile on as many “lights” as you can, and don’t forget the star at the top! You can take a peak at this delicious breakfast dish over at Kids Activities Blog! Sugar Cookie Christmas Ornaments – These sugar cookie Christmas ornaments are such a fun and creative idea! I love the idea of using all sorts of colors and patterns with the chocolate candies on top. 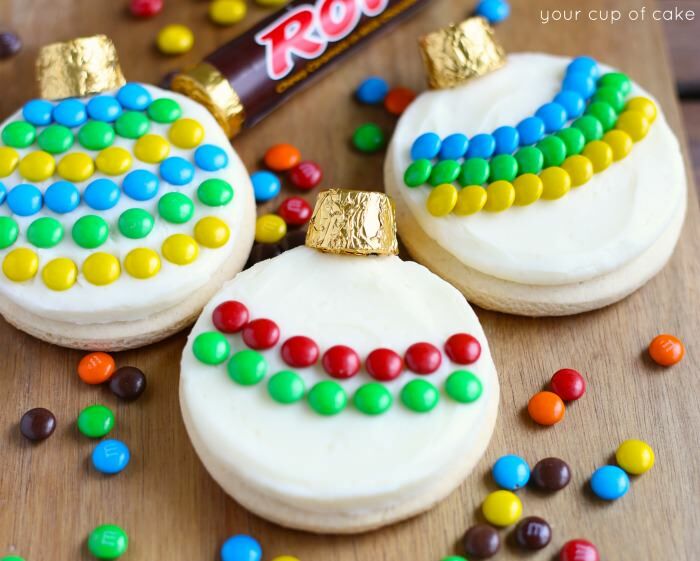 You can find this recipe and more cookie ornament decorating ideas at Your Cup of Cake! Reindeer Rice Krispie Pops – Rice Krispy Treats are one of my all time favorite treats to eat – no matter what time of year it is! 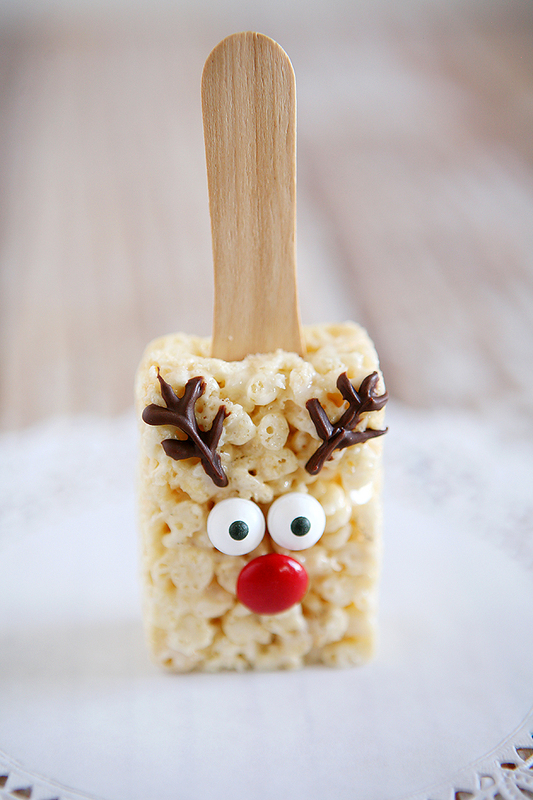 I love how cute and simple these little reindeer rice krispy pops are! 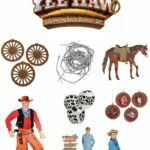 You can see how to put these together over at Thirty Handmade Days! 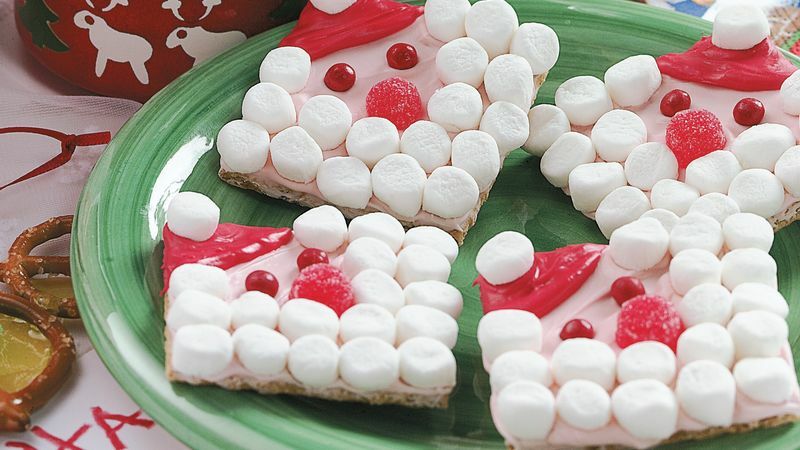 Santa Grahams – I am totally loving these super fun little Santa Claus graham cracker squares! Betty Crocker really knows how to make some delicious holiday treats! You can find more info on these sweet treats by visiting their site linked above! 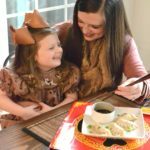 Edible Elf Hats – Sometimes I get so caught up in Santa and his reindeer that I forget about Santa’s elves! 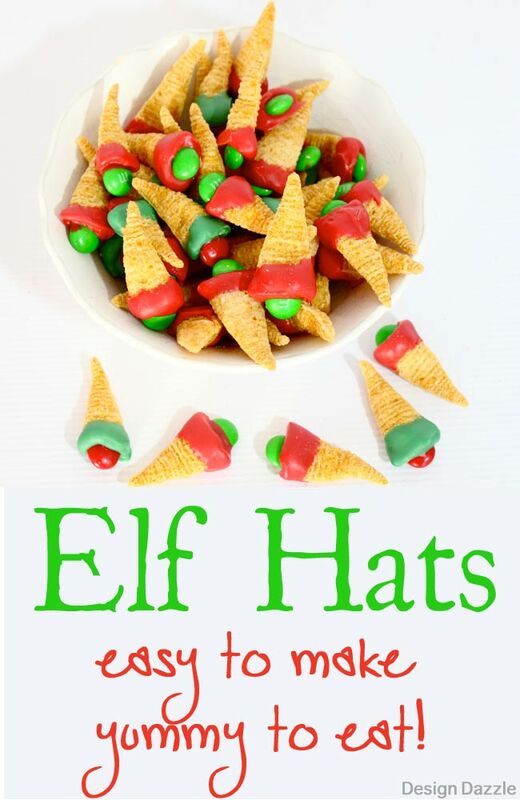 These cute little elf hats combine sweet and salty…which is right up my alley! 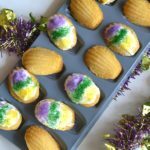 Design Dazzle has the scoop on how to create these little bites of sweetness! 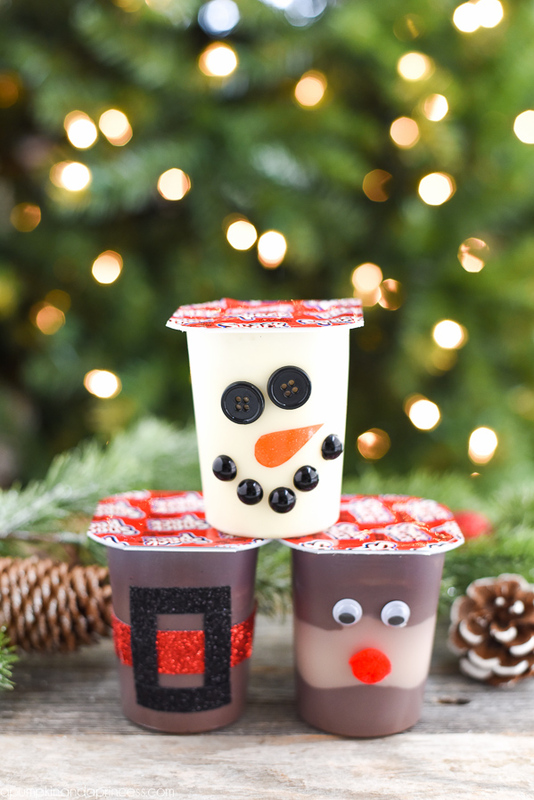 Simple Christmas Pudding Snack Cups – If you’re looking for an easy craft to put together for the kids at school or at a Christmas party, this is a great way to turn a snack kids already love into something super fun and festive! A Pumpkin and a Princess is sharing all the details over on their blog! 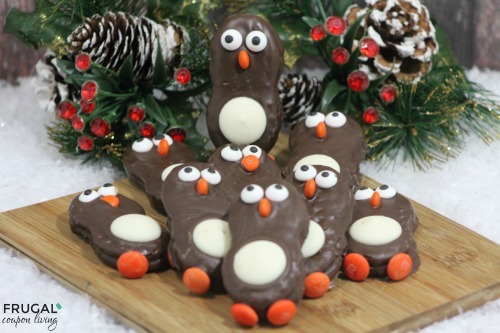 Frosty the Snowman Pretzels – Frosty the snowman may have been a jolly happy soul, but that doesn’t even compare to how these delicious chocolate covered pretzels would make me feel! These look so yummy I could eat them right off the page! You can find a full-detail tutorial on how to create these delectable little snowmen over at TheWhoot.com! 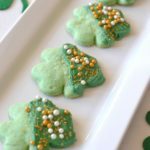 Holiday Poinsettia Pretzel Bites – One of my favorite things to see during this time of year is beautiful poinsettias incorporated into home decor. 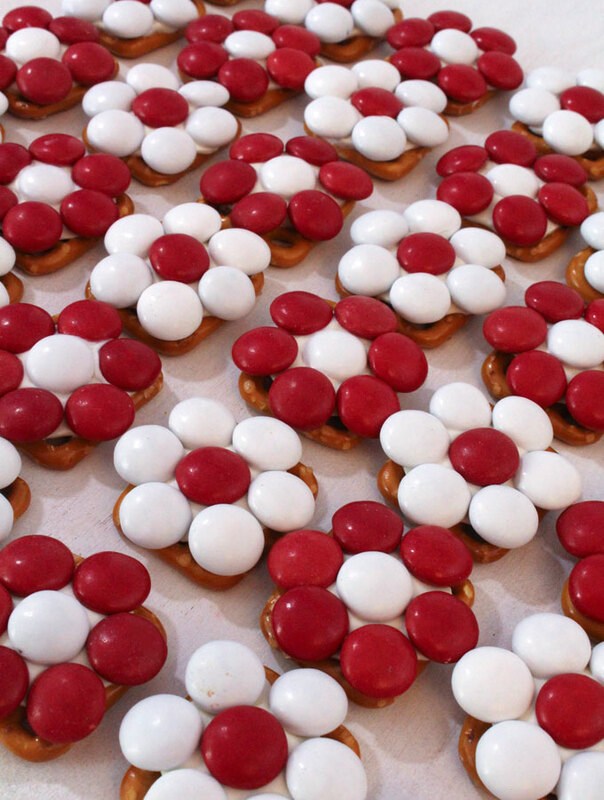 I never would have thought about recreating the look with pretzels and chocolate candies! Two Sisters Crafting have a fantastic tutorial on how to make these flowery candies that are almost too pretty to eat, so head on over and check it out! 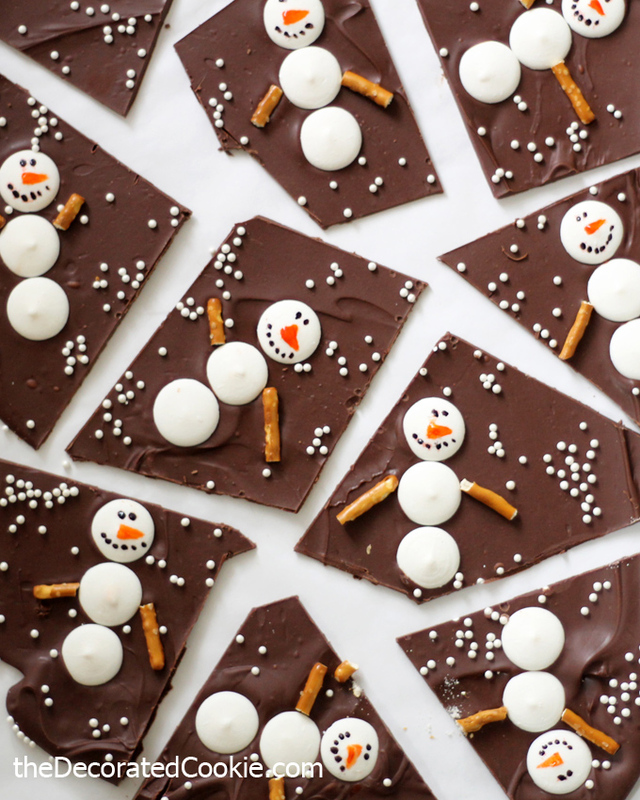 Snowman Chocolate Bark – The Decorated Cookie put together these amazing little chocolate bark snowmen that are just making me melt over here! Adding the salty pretzel to the chocolate and marshmallows really takes this treat over the top! 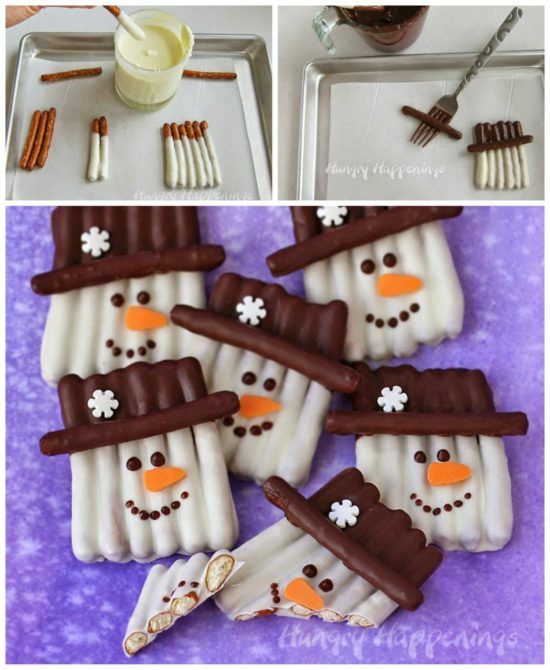 Visit their website to find our more about how to make these cute little snowmen snacks! 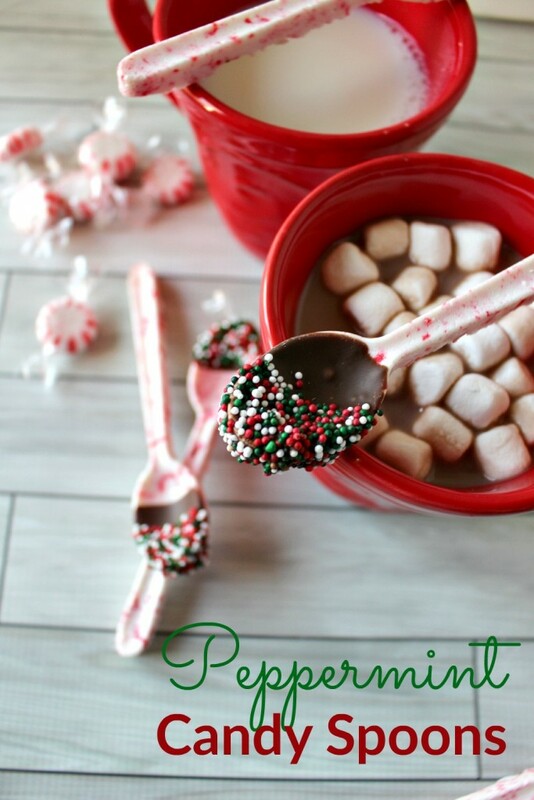 DIY Peppermint Candy Spoons – Every kid should know what it’s like to curl up in a pile of blankets and stir a big cup of hot chocolate with a candy coated spoon! I used to make these ALL the time when I was a kid. They also make amazing gifts! You can find a full tutorial over at Princess Pinky Girl! Reindeer Cupcakes – You absolutely, positively cannot go wrong with cupcakes! I’m pretty sure any kid would agree, too! 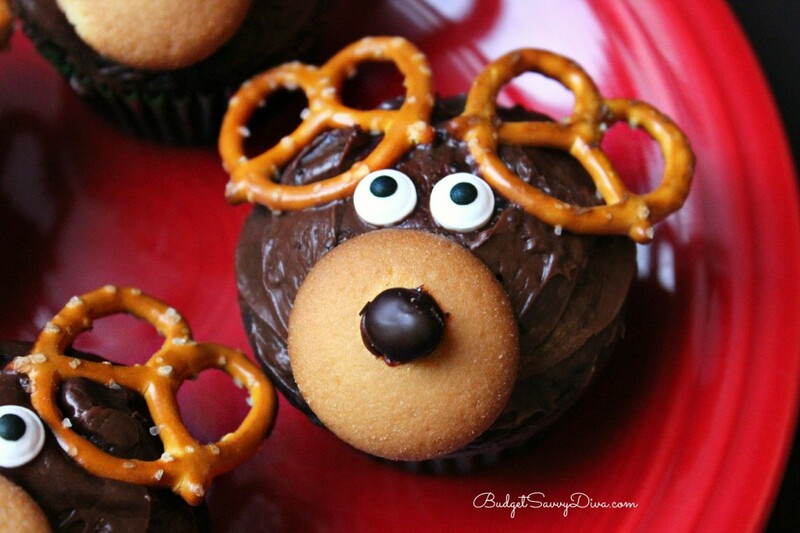 These simple little reindeer cupcakes are fun for the kiddos to make, but even more fun to eat! 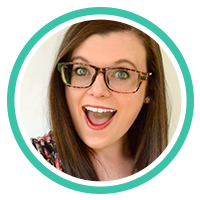 Check out the full recipe over at Budget Savvy Diva! 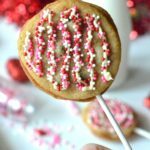 Chocolate Covered Strawberry Christmas Trees – Strawberries AND Oreo cookies?? Talk about a match made in Heaven! 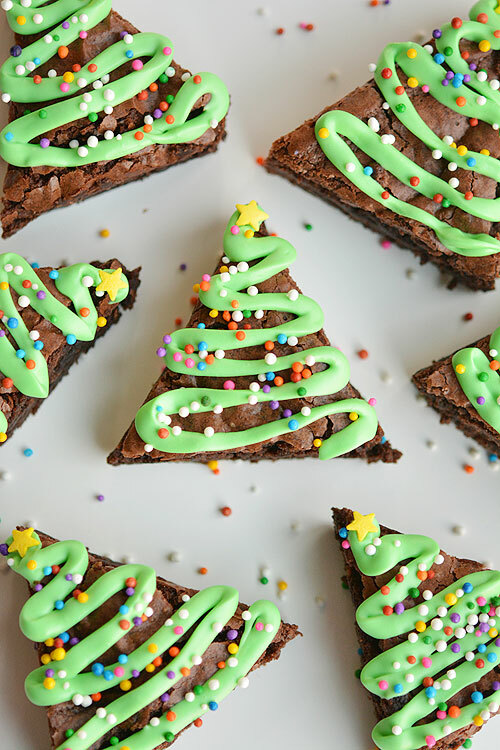 Those little chocolate dipped Christmas trees are just too gorgeous to eat! Kids can have lots of fun adding all sorts of sprinkles to their trees to make them their own! 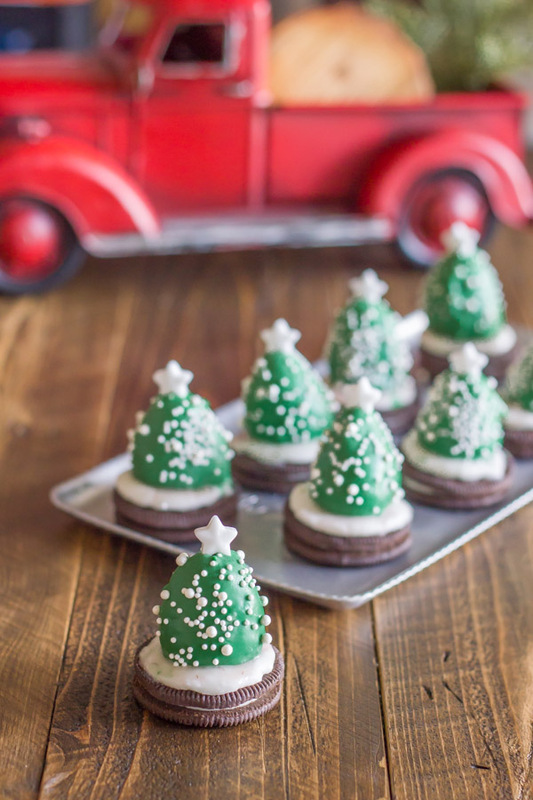 Find how how to make these delightful little treats over at Lovely Little Kitchen! 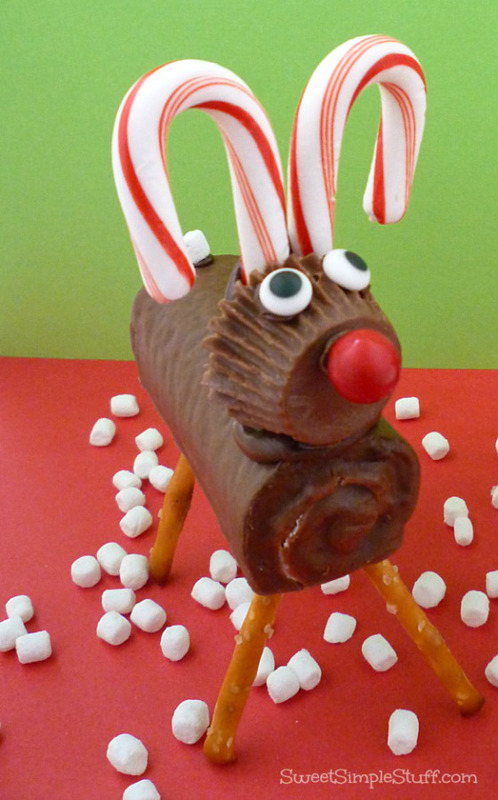 Swiss Roll Reindeer – Hello, swiss rolls! Mmmm, they’re one of my guilty pleasures! I love seeing them transformed into something as cute as this little reindeer! You can learn how to assemble these delicious little deer over at Sweet Simple Stuff! 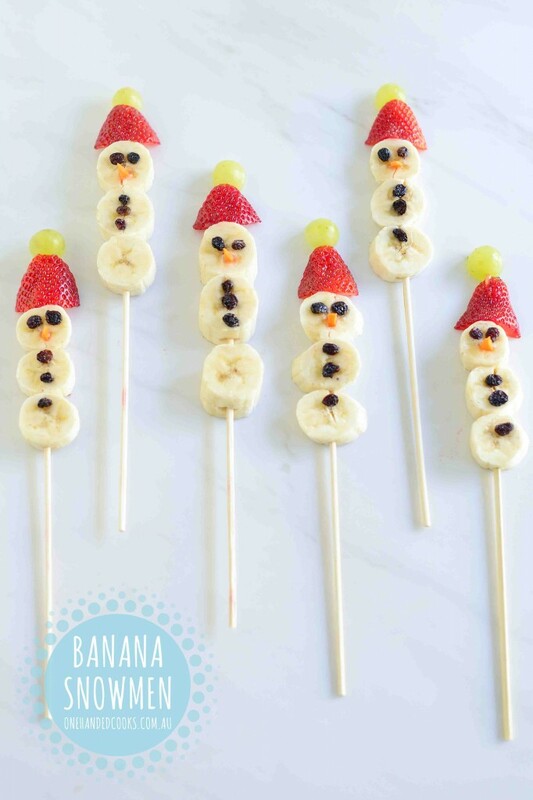 Banana Snowmen – This scrumptious little Christmas craft is great for all ages, but it’s especially great for toddlers who are all about the finger foods and snacks! My 18 month old is crazy about bananas, and I just know she’ll love seeing the cute little faces on these snowmen made from her favorite snack! One Handed Cooks has a full post where you’ll find more info on how to make this one! 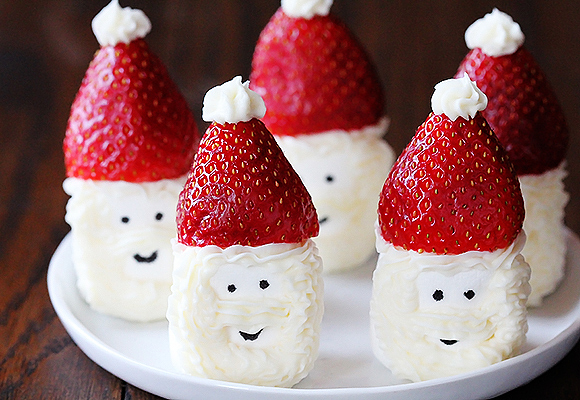 Santa Hat Marshmallow Snack – Who would’ve thought you could turn little marshmallows into something SO cute?! 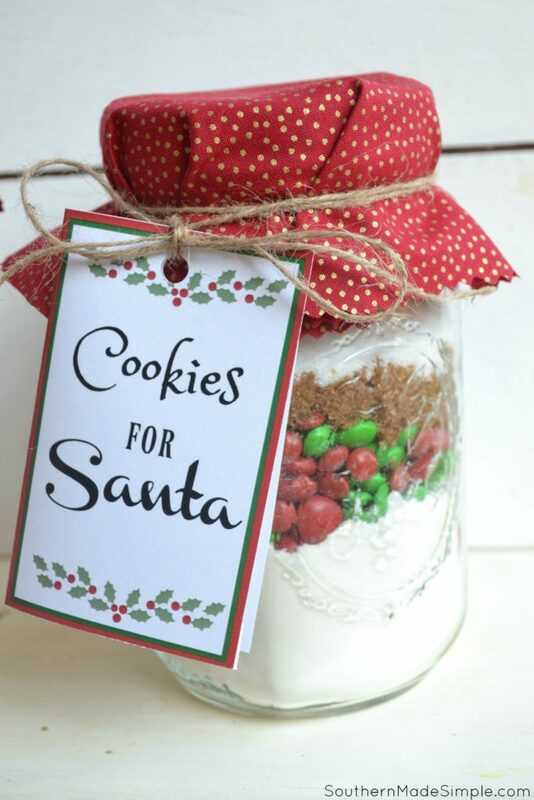 I absolutely love this idea from Tablespoon.com. 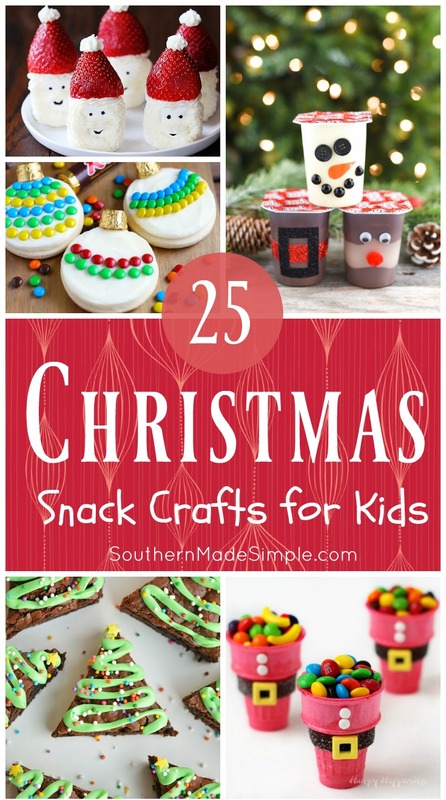 They’ve got tons of other great holiday snack ideas that are just begging to be devoured, too! 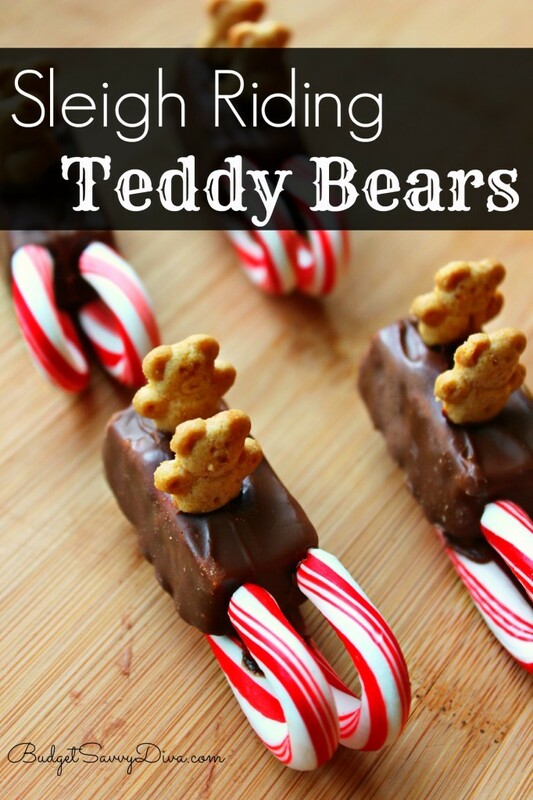 Sleigh Riding Teddy Bears – Kids will definitely go crazy over these adorable little Teddy Grahams riding in a yummy sleigh! You can read more about this sweet little craft over at Budget Savvy Diva! 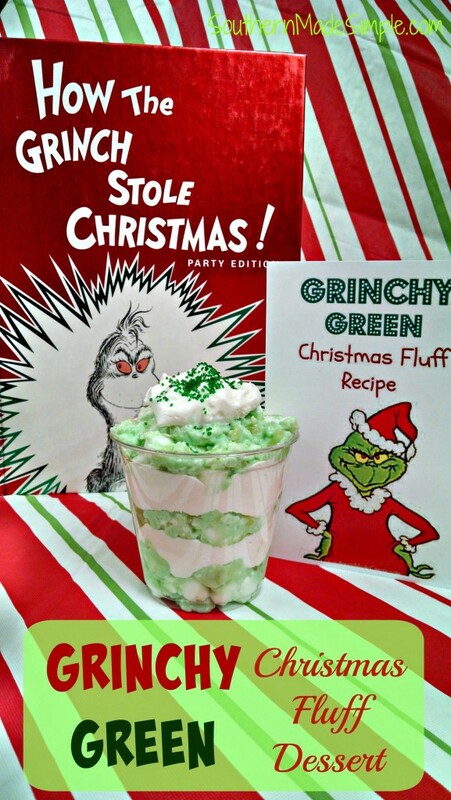 Grinchy Green Christmas Fluff Dessert – Watching Dr. Seuss’ How The Grinch Stole Christmas is one of my favorite things to do every year! This dessert is absolutely delicious, and fun to eat while watching the movie! Santa Suit Candy Cups – Does your kid need something to hold all of those yummy little Christmas confections so that they don’t melt in their hand? 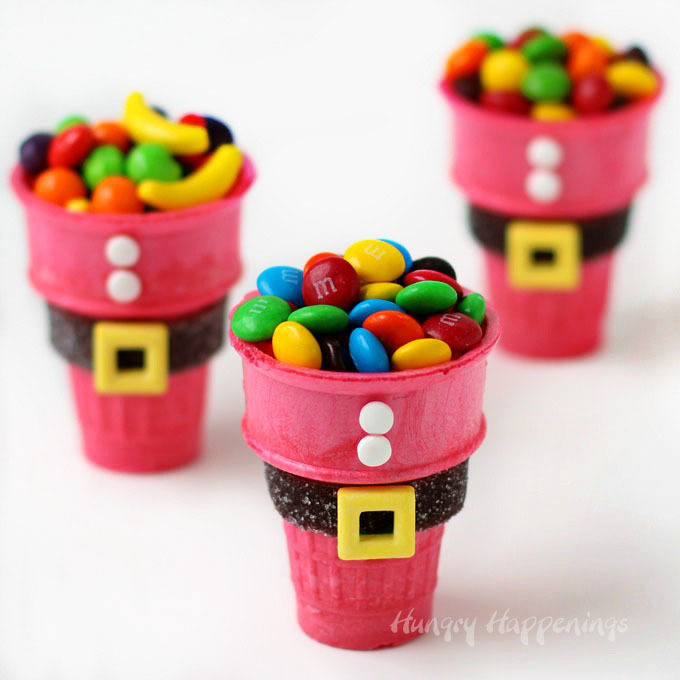 These Santa suit candy cups will definitely do the trick! You can find more details on how to make these little guys over at Hungry Happenings! 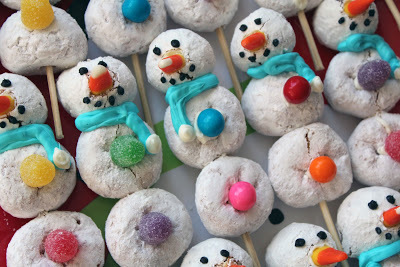 Powdered Snowman Donuts – These little snowmen on a stick are an absolute MUST have for any winter or Christmas party! Those little white powdered donuts are so darn addicting! You can read more about them over at Worth Pinning! How will you be celebrating Christmas this year? Do you have any fun traditions, recipes or crafts that your family likes to put together every year? Leave a comment below and share the Christmas love! This is indeed a lovely craft idea! My kid loved the Rise crispy pops and I will try few more this weekend. Thanks for such a great article. 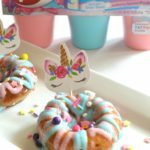 These look yummy and fun. Thank you for putting together this list.